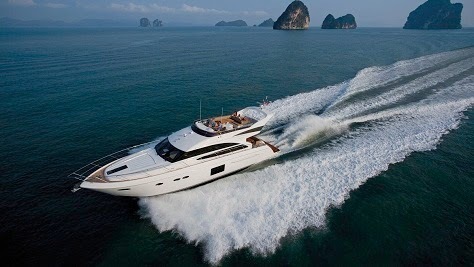 We are pleased to share with you a fresh look at the stunning Princess 64. Pictured above is the 64 fitted with an optional new style hardtop and with a grey hull finish. Below is a selection of the latest interior photography showing a new contemporary style. Whether you’re relaxing or entertaining, her exterior provides exceptional space and flexibility. The flybridge creates a magnificent family entertaining space, with a large table for alfresco dining, generous seating and full wetbar with barbecue. The table in the cockpit gives you an alternative location to eat and relax. For those guests that enjoy swimming or water sports, the electro-hydraulic bathing platform can house a 3.25m jet-rib, to enable effortless launch and recovery. Her interior is light, welcoming and impeccably finished with the finest fittings and materials. The dining area is located forward of the saloon and adjacent to the galley, turning the whole of the main deck into a highly sociable area to entertain. Highly unusual for this size of craft, her lower accommodation features four spacious cabins, three of which enjoy en-suite facilities. All are furnished to the highest of standards. A fifth aft cabin, with twin beds and en-suite shower room, can also be optionally specified for crew or occasional guests. Highly unusual for this size of craft, her lower accommodation features four spacious cabins, three of which enjoy en-suite facilities. All are furnished to the highest of standards. You can also specify a fifth aft cabin, with twin beds and en-suite shower room, for crew or occasional guests.